You are here: Home / Rider News EU 2012 / Over The Rainbow! 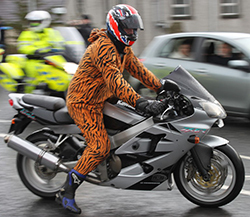 We gave specific examples of motorcycle safety initiatives in Northern Ireland, Great Britain, Norway and Sweden. However languishing on the European Commission’s Transport Road Safety website in the section, “Making roads safer for motorcycles and mopeds”, is a list of projects, many of which have received funding from the EC. We have disagreed with the purpose of some of these projects, especially those concerning ITS (Intelligent Transport Systems). 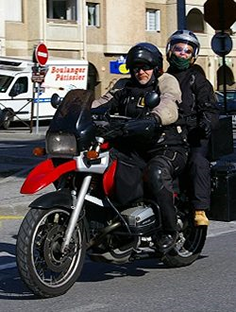 There are some projects and reports that have been paid for, produced, had their moment in time and are now just sitting forgotten on a dusty shelf, as for example SAFERIDER, (Right To Ride on SAFERIDER) which focused on warning systems for motorcycles, cost c.5 million Euros and appears to have gone nowhere. Another of these projects was “eSUM” which gathered together a, “Good Practice Guide” and aimed to contribute to reducing urban powered two wheeler (Mopeds – Scooters – Motorcycles) casualties. It formed a comprehensive resource for anyone working to improve road safety for PTW riders. eSUM ran from 2008 until 2010 and was a collaborative initiative between industry & local authorities of Europe’s principal motorcycle cities. Although we were aware of the project, it dropped off our radar, until we were pointed to the eSum website. The website appears to have been up dated, especially with videos in different languages from an overall video of the project, to the four cities in the project, including London and their “Action Pack” which is available in six languages. The eSum “Action Pack” is a manual which is aimed at helping cities to promote PTW (Powered Two Wheeler – motorcycles – Scooters – mopeds) urban road safety, a guide to help administrations implementing action plans specifically aimed at PTW safety, to help identify actions required to analyse PTW safety issues, and decide upon suitable safety interventions. ROSA’s main objective was to help to reduce European motorcyclist accident rates through the elaboration and dissemination of a “Handbook of the best practices in regards to Powered Two Wheeler (PTW) safety” to the highest possible audience. This was according to the project, disseminated to an estimated 5 million people in Europe which included at 11 European race circuits during the “FIM MotoGP 2010 World Championship” with workshops alongside 5 of the Moto Gps. Whether the 5 million people actually were aware or took notice of it, is debatable. Meanwhile back in 2008 the Norwegian Public Roads Administration, in co-operation with the Joint Transport Research Centre of the OECD and the International Transport Forum, hosted a Workshop on Motorcycling safety in Lillehammer (Norway) on 10-11 June 2008. The objectives of the workshop were to identify the real problems of motorcyclist safety, discuss practical solutions to these problems, and propose a set of measures to improve safety. The focus of the workshop was mainly on the 50 countries of the International Transport Forum, but safety issues at the global level were also considered. The workshop identified a list of the top twenty priorities regarding motorcycle safety which were overwhelmingly, in harmony with the views of riders. The latest project which looks like going nowhere – is RIDERSCAN, administered by the Federation of European Motorcyclists Associations (FEMA) and co-funded by the European Commission. The RIDERSCAN project gathers existing information on motorcycle safety in Europe; identifies needs for action and creates a cross-border knowledge-based network, or in other words, another point of contact to find out information about motorcycle safety. Another EU project, funded by the same DG MOVE, which is headed by Siim Kallas, who as mentioned above, states that “Motorbikes remain a problem”. This is in spite of the fact that FEMA was instrumental in the OECD Lillehammer Conference on motorcycling in 2008; in spite of the fact that FEMA was instrumental in putting together the Initial Rider Training manual; in spite of the fact that FEMA organisations such as NMCU Norway, SMC Sweden have produced really valuable reports and information relating to motorcycle safety, offering good, solid, intelligent solutions to the “problems” that motorcyclists face out on the road; in spite of organising a European Motorcycle Forum in 2010, which was attended by the great and the good of Brussels and beyond. With all that knowledge and experience, FEMA has taken on a monumental task with RIDERSCAN, that “based on collected data, which includes a survey addressing riders in Europe directly, it will develop a thorough assessment of national transport and motorcycle safety policies, promote the exchange of best practices and create a solid basis for future decision-making”. This sound impressive and challenging, considering the fact that there are 27 member states and there are 23 official languages. With a budget of (only) 600,000 Euros, it looks more like a trip on the Titanic, doomed never to arrive at its destination. A lot of money is changing hands in the motorcycle research arena, and there appears to be a rearranging of deckchairs, with funding going to consortia that are simply perpetuating the same ole same ole – with a new title. Will RIDERSCAN simply be another “Road Safety Knowledge Centre” on another website? We will wait and see. In the meantime, back to EU projects. According to FEMA’s latest newsletter, the hot topic in Brussels is “Intelligent Transport Systems” (ITS) and the integration of ITS and motorcycles. FEMA has already been involved in in three EU funded ITS projects: SAFERIDER, 2-BE-SAFE; SMART RRS. It looks like we’re in for more of the same. So what will be the next ITS project on the horizon? Looking into a crystal ball……..Will it be Naturalistic Studies, or ITS focusing on Vulnerable Road Users? Who knows, but what we do know is that it’s a hell a lot of money and if we believe Mr Kallas – it doesn’t seem to be making much difference. On our Right To Ride EU website and mirrored on our Right To Ride website is our, “Virtual Library”. We have collected and posted up a raft of research, safety and other related publications from Crash Barriers to Manhole Covers to strategies to statistics and road safety videos from around the world. 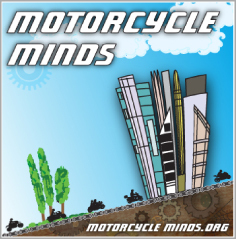 If you know of any motorcycle related documentation that is not there and you think should be there, give us a shout and we see about getting it inserted in the library.